God our Father, we are gathered here to share in supper which your only Son left to his Church to reveal his love. He gave it to us when he was about to die and commanded us to celebrate it as the new and eternal sacrifice. 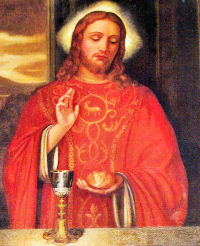 We pray that in this Eucharist we may find the fullness of love and life. Grant this through our Lord Jesus Christ, your Son, who lives and reigns with you and the Holy Spirit, one God, for ever and ever. Amen.